Draft: 2002, Atlanta Braves, 2nd rd. Wife's name is Ashley and the couple has two children: son, Colt and daughter, Colbie…The couple met in high school ... His father, Howard, coached baseball at Howard University…His brother, Brad, played first base in the Marlins and Royals organization from 2004-2007 ... Graduated from Duluth High School (GA) in 2002, where he starred in baseball and basketball…His #32 baseball jersey was retired in 2009. Completed his 14th major league season, appearing in 63 games with Houston, while also missing 50 games on the disabled list after undergoing arthroscopic surgery on his right knee on 7/3 ... Surpassed 1,500 career games played at catcher during the season, ending the year with 1,529 career games at the position, the 30th-most in MLB history ... Played his 1500th game behind the plate on 5/20 vs. CLE…Went 1-for-3 with a home run ... Made his 12th career Opening Day roster and second with the Astros ... Became the 30th catcher in MLB history to start 12 Opening Day games ... Went 1-for-4 in an Opening Day start at catcher on 3/29 at TEX…The single was his 14th career hit on Opening Day…Only 16 catchers in MLB history have recorded more ... Placed on the 10-day disabled list with right knee soreness on 5/29 ... Missed nine games and was activated on 6/8 ... Went back on the DL on 7/3 (strained right knee) and team medical director Dr. David Lintner performed arthroscopic surgery on McCann's right knee that day in Houston ... Upon his return from knee surgery, compiled a .372 on-base percentage in 13 games to end the season ... His seven home runs snapped a streak of 12 consecutive seasons with at least 15 home runs… Was one of three players in the majors (Miguel Cabrera and Albert Pujols) with as long a streak ... Started two games during the postseason: ALDS Game 3 at CLE and ALCS Game 3 vs. BOS. Hit 18 home runs in his first season with the Astros and helped guide the club to its first World Series Championship in franchise history...marked the second-most homers hit by an Astros catcher in a single season behind only Evan Gattis' club record of 19 set in 2016...was his 12th season with at least 15 homers...joined Albert Pujols and Miguel Cabrera as the only MLB players with at least 15 homers in every year since 2006...became the sixth catcher in Major League history to have 12 seasons with at least 15 homers, joining Carlton Fisk (13), Johnny Bench (13), Mike Piazza (12), Lance Parrish (12) and Yogi Berra (12)...leapfrogged Roy Campanella (239), Javy Lopez (243) and Jorge Posada (246) to move into eighth place on MLB's all-time home runs list by a catcher (250)...his 58 RBI as a catcher ranked fifth in club history for a single season, and were the most since Mitch Meluskey drove in 67 in 2000...among AL catchers, ranked fourth in RBI, OBP, slugging and OPS, tied for fourth in walks and fifth in homers...started 94 games behind the dish, his most since starting 119 games in 2015... hit .417 (5x12) with 15 RBI in bases loaded situations...marked his most RBI in bases loaded situations since the 2010 season (22 RBI)...made his 11th career Opening Day roster...served a stint on the 7-day concussion DL from May 21-27...was placed on the 10-day DL on Aug. 14 with right knee soreness...activated on Aug. 24...started on Opening Day on April 3 vs. SEA, catching a 3-0 shutout win...became the third catcher in club history to catch a shutout on Opening Day, joining Jason Castro (2015) and Brad Ausmus (2006)...homered on April 4 vs. SEA, which marked his first homer while batting 8th in the order since June 14, 2007 at MIN off LHP Johan Santana... stole second base on June 2 at TEX...was his first steal since Aug. 20, 2016 at LAA, and just his second steal since the 2013 season...tied his single-game career high for hits on June 7 at KC, going 4x5 with a homer and two RBI... was his second consecutive game with a homer, marking the first time he homered in back-to-back games since 2015...posted his third four-RBI game of the year on Aug. 27 at LAA, hitting a go-ahead, bases-clearing triple in the 8th inning...was his first triple in a 1,153 at-bat span (since April 18, 2015 at TB)...tied a franchise record for most games with four RBI in a single year by a catcher with Hank Conger (2015)...finished the year strong after serving a stint on the DL due to right knee soreness...in 22 games following his activation from the DL on Aug. 24, hit .275 (19x69) with two doubles, one triple, five homers, 14 RBI and a .913 OPS (.363 OBP/.551 SLG)...in 10 games prior to hitting the DL, had gone 4x36 (.111) with one extra-base hit...started at catcher in 17 of the Astros 18 postseason games, hitting .175 (10x57) with two doubles and one homer...hit a bases-loaded, two-run single in Game 1 of the ALDS vs. BOS...snapped the Astros 15.0-inning scoreless streak with an RBI double in Game 6 of the ALCS vs. NYY, going 2x4...was his first multi-hit game in the postseason since Game 4 of the 2010 NLDS...hit a two-run double in Game 7 of the ALCS vs. NYY, becoming the third player in franchise history to record a double and an RBI in consecutive postseason games...also Lance Berkman (2005) and Craig Biggio (2004)...went 3x4 with an RBI in Game 3 of the World Series vs. LAD, joining Brad Ausmus (Game 6 of the 2005 NLCS) as the only catchers in club history with three hits in a postseason game...marked a single-game postseaosn career high for hits...hit a solo homer in Game 5 of the World Series vs. LAD...was his first postseason homer since Game 4 of the 2010 NLDS. Hit .242 (104x429) with 13 doubles, 20 homers, 58 RBI and a .335 OBP in 130 games (86 starts at catcher; 28 at DH) with the Yankees...hit .249 (85x342) with 17 homers and a .340 OBP against right-handed pitchers... reached the 20-homer plateau for the ninth straight season, joining David Ortiz as the only Major League players to do this...tied a career-high with three multi-homer games (also 2011)...became the third Yankees catcher in a 50-year span to have three multi-homer games, joining Russell Martin (4 in 2011) and Matt Nokes (5 in 1991)... Gary Sanchez joined him later in the season...led all AL catchers in OBP and OPS (.751), while ranking second in slugging (.419) and fifth in home runs (16)...he and Gary Sanchez (20HR) made the Yankees the third team in Major League history to have two catchers hit at least 20 home runs in the same season...also the 1965 Milwaukee Brewers (Joe Torre-27HR/Gene Oliver-21HR) and the 1961 Yankees (Elston Howard-21HR/Johnny Blanchard- 21HR)...made his 10th career Opening Day roster and start...reached base safely at least twice in each of his first five games of the season, batting .500 (9x18) with 10 runs, two homers, four RBI and four walks (April 5-12)... became the third Yankees catcher in over 100 years to reach base safely multiple times in each of his first five games of a season, joining Don Slaught (1988) and Wally Schang (1922)...was the first Major League catcher to do so since Victor Martinez in 2009...also became the second Major League catcher since at least 1913 to score 10 runs over his team's first six games of a season, joining Yogi Berra (1950)...snapped an 0x21 stretch with a tworun homer on May 30 at TOR...matched his career-long hitless streak...had a career-long, 17-game road hitting streak from June 19-Aug. 20...hit .348 (24x69) with six homers and 12 RBI during the run...had a 19-game road on-base streak that was from June 19-Aug. 22...his three multi-homer games came on June 19 at MIN, June 29 vs. TEX and Sept. 8 vs. TB...were his first multi-homer contests since 2014...on June 29, hit a solo homer in the 8th inning and a game-tying three-run homer in the 9th inning...per Elias, became the first Yankee to hit home runs in the 8th and 9th innings of the same game since Tony Clark homered in the 6th, 8th and 9th innings on Aug. 28, 2004 at TOR...had two 10-game hitting streaks (July 23-Aug. 5, June 27-July 9)...was the first time in his career he recorded two double-digit hitting streaks in the same season...recorded a steal on Aug. 20 at LAA...was his first stolen base since Sept. 26, 2012 vs. MIA...had gone 470 games without a stolen base, which was the sixth-longest active streak in the Majors at the time...played his 1,500th career game on Sept. 21 at TB, going 4x5 with an RBI to tie his career high in hits...was his 12th career four-hit game, and first since Sept. 3, 2014 vs. BOS...hit home run No. 20 on Oct. 2 vs. BAL. Hit .232 (108-for-465) with 68R, 15 doubles, 26HR and 94RBI in 135 games (119 starts at C, three at DH) with the Yankees...established a career high in home runs and tied his career high with a team-leading 94RBI (also 94RBI in 2009 w/ Atlanta)...led all Major League catchers in home runs and ranked second in RBI (Buster Posey-95)...his 2.9 WAR (FanGraphs) was fourth-highest among Major League catchers...Won his sixth career Silver Slugger Award as the AL's top hitting catcher...was his first career AL Silver Slugger...Became the sixth catcher in franchise history to hit 25HR in a season, joining Yogi Berra (six times, 1950-53, '55-56), Bill Dickey (twice, 1937-38), Jorge Posada (twice, 2000, '03), Elston Howard (1963) and Mike Stanley (1993)...Was tied with Nolan Arenado, Edwin Encarnacion and Carlos Gonzalez for the Major League lead with 8HR with at least two men on base...marked the most such HRs by a Yankee since Alex Rodriguez in 2007 (also eight)...Has led the Yankees in RBI each of the last two seasons (had 75RBI in 2014)...according to Elias, is the seventh player to lead the Yankees in RBI (outright or tied) in each of his first two seasons with the club, joining Babe Ruth (first five seasons from 1920-24), Roger Maris (three, 1960-62), Reggie Jackson (four, 1977-80), Dave Winfield (three, 1981-83), Tino Martinez (three, 1996-98) and Jason Giambi (two, 2002-03)...Hit .365 (19-for-52) with 11R, 2 doubles, 7HR, 32RBI and a 1.227 OPS in the first inning, tied for the second-most RBI by any player in any inning in 2015 (Nolan Arenado-39RBI, first inning; Paul Goldschmidt-32RBI, first inning)...marked the most RBI in a single inning in a season by a Yankee since Dave Winfield had 40RBI in the first inning in 1985...was the ninth-highest OPS by any player in any inning (min. 50PA) and the Majors' second-highest first-inning OPS (Arenado-1.274)...Caught 26-of-76 potential base stealers (34.2%), the fifth-best percentage in the Majors...his AL-high 26CS ranked second among MLB catchers behind only San Diego's Derek Norris (38)...since joining the Yankees in 2014, the club has allowed at least 3SB in a game just three times, the fewest such games by any team over the span...Caught the first 18 innings of the Yankees' 19-inning loss on 4/10 vs. Boston, going 2-for-6 with 1 double, 1RBI, 1SF and 1HP before being removed for PR (Murphy) in the bottom of the 18th...Hit his 200th career home run (solo) in 4/12 win vs. Boston...is one of only six catchers in Baseball history (min. 90% of career games played at the position) to reach 200HR by age 31, joining Johnny Bench, Yogi Berra, Lance Parrish, Mike Piazza and Ivan Rodriguez...Had a streak of at least 1RBI in eight straight games from 5/20-30...was the longest such streak by a Yankee in 2015 and matched the longest of his career (also 8G from 7/8-19/06)...was the longest RBI streak by a Yankee since Robinson Cano from 6/27-7/6/12 (9G)...was the first Yankee to drive in runs in eight consecutive games, all as a catcher, since Aaron Robinson from 8/8-15/46 (credit: Elias)...the only longer RBI streaks, all as a catcher, in franchise history were both by Bill Dickey: 10G from 4/29-5/11/38 and 9G from 5/29-6/5/32, according to Elias...also had an eight-game hitting streak over the stretch...Homered in four consecutive games from 5/25-29, becoming just the second Yankee since 1957 to accomplish the feat while playing catcher, joining Mike Stanley (4HR total from 7/20-25/93)...from 5/25-28, joined Stanley (7/20-23/93) as the only two players in Yankees franchise history to reach base safely three times with a home run in each of three straight games, all as a catcher...Hit his 11th career grand slam-and first as a Yankee- in 6/27 win at Houston...was his first grand slam since 6/23/13 at Milwaukee w/ Atlanta...was his 10th grand slam as a catcher, tying Johnny Bench for the third-most in Baseball history behind only Mike Piazza (14) and Gary Carter (11)...Hit 12th-inning "walk-off" three-run HR in 7/3 win vs. Tampa Bay...marked his seventh career "walk-off" hit and third as a Yankee...was his fourth career "walk-off" HR and second as a Yankee.//Hit three-run HR and was 3-for-5 with 1 double and a career high-tying 5RBI (all in the first three innings) in 8/17 win vs. Minnesota...also caught three runners trying to steal (tying his single-game career high), becoming the first catcher in Yankees history with at least 5RBI and 3CS in a single game and the first Major League catcher to do so since Brad Ausmus for the Astros in 2003...was the first Yankees catcher to throw out three attempted base stealers since Jorge Posada had 3CS on 8/8/06 at Chicago-AL...Was 0-for-4 in the Yankees' 10/6 Wild Card Game loss vs. Houston. Batted .232 (115-for-495) with 57 runs, 15 doubles, 23 HR and 75 RBI in 140 games (101 starts at C, 13 at DH and 11 at 1B)in his ﬁrst season with the Yankees…had never appeared at 1B in his Major League career entering the season... Of his 23 HR, 19 came at Yankee Stadium…became the second player in franchise history to hit 16 of his ﬁrst 18HRfor the Yankees at home, joining Joe Sewell in 1931-33 (credit: Elias)… Elias also notes he is the ﬁrst Major Leaguerto hit at least 16 of his ﬁrst 18HR with a team at home since the Angels' Dave Hollins from 1997-98... Collected his ﬁrst hit as a Yankee with an eighth-inning RBI single in 4/1 Opening Day loss at Houston... Hit solo HR-his ﬁrst as a Yankee-and two-run HR and was 2-for-4 in 4/12 win vs. Boston…was his 10th career multi-HR game and ﬁrst since 5/28/13 at Toronto (w/ Atlanta)…was his ﬁrst of two multi-HR games in 2014 (also9/21 win vs. Toronto)... Started at catcher in 4/24 win at Boston, but moved to ﬁrst base in the ninth inning, marking his ﬁrst career appearance at a defensive position other than catcher... Made his ﬁrst career start-and fourth appearance-at 1B in 5/28 win at St. Louis (2-for-4, 1R, 1RBI, 1BB)... Hit two-run HR and a bases-clearing triple in 6/18 win vs. Toronto, tying his career high with 5RBI (sixthtime, ﬁrst since 7/18/10 vs. Milwaukee)…was his third career triple (also 4/24/08 vs. Florida and 6/6/09 vs.Milwaukee)…was the ﬁrst time in his career he hit a triple and a home run in the same game... Missed two games (7/4-5) with a sore left foot... Reached base safely in 19 straight games from 7/2-26/14, batting .338 (25-for-74) with 8R, 4 doubles, 2HR and 8RBI in those games…was tied for the second-longest such streak of his career (also 19 straight from7/11-8/13/08) behind a career-high 26-game stretch of reaching safely from 6/18-7/26/06... Hit safely in a season-high 11 straight games from 7/11-26, hitting .372 (16-for-43) with 4R, 2 doubles, 1 HR and 5RBI over the stretch…was his sixth career double-digit hitting streak and his longest hitting streak since7/3-21/12 w/ Atlanta (also 11 straight)... Hit ninth-inning "walk-oﬀ" single and was 2-for-5 with 1RBI in 7/20 win vs. Cincinnati…was his ﬁfth career "walk-oﬀ" hit, ﬁrst as a Yankee and ﬁrst since 5/17/11 vs. Houston w/ Atlanta (HR)... Made seven straight starts at 1B from 7/22-28... Was placed on the 7-day concussion disabled list from 8/9-17 (missed six games)…suﬀered injury on foul tipon 8/9 vs. Cleveland... Homered in a career-high three-straight home games from 8/24-9/3... Hit pinch-hit, three-run "walk-oﬀ" HR in the 10th inning on 8/24 vs.Chicago-AL…was his sixth career "walk-oﬀ" hit and second of theseason (also 7/20 vs. Cincinnati) and third career "walk-oﬀ" HR (laston 5/17/11 w/ Atlanta vs. Houston)…was his third career pinch-hit HR (last also on 5/17/11)…was the ﬁrst pinch-hit "walk-oﬀ" HR by aYankee since Jason Giambi on 6/5/08 vs. Toronto (ninth inning oﬀ B.J.Ryan)…according to Elias, is one of three Yankees to hit a pinch-hit"walk-oﬀ" HR in extra innings, joining Bob Cerv in 1960 and GaryWard in 1988…was his eighth career extra-inning HR (credit: Elias)... Hit 8 HR with 18 RBI in September, his highest totals in both categories in a calendar month since July 2012 (9 HR and 21 RBI)... Tied his career high with 4H in 9/3 win vs. Boston (11th time, ﬁrstsince 7/6/13 at Philadelphia w/ Atlanta)... Homered in back-to-back games at Camden Yards from 9/13-14…his home run on 9/13 was just his third road homer of theseason and ﬁrst since 5/23 at Chicago-AL, snapping a 37-gameroad homerless stretch and marking the second-longest suchstretch of his career behind a 48-game homerless span on theroad from 8/20/10-6/4/11 w/ Atlanta... Pinch-ran for Derek Jeter after Jeter's ﬁnal career hit in the third inning of 9/28 win at Boston…was his second career pinch-running appearance (also 5/25/12 vs. Washington w/ Atlanta for David Ross). Batted .256 (91-for-356) with 43R, 13 doubles, 20HR and 57RBI in 102 games with Atlanta… posted a 2.98 catchers' ERA, the lowest such mark in the Majors since the Dodgers' Paul Lo Duca in 2003 (2.73). Was named to his seventh career All-Star game (also 2006-11), replacing injured teammate Freddie Freeman. Began the season on the 15-day disabled list from 3/23-5/6 recovering from right shoulder surgery performed on 10/16/12… missed the Braves' first 30 games of the season. Led all Major League catchers with 20HR from the time of his season debut on 5/6 through the end of the year. Batted .349 (38-for-109) with 9HR and 27RBI over a 29-game span from 6/23-8/2. Recorded at least one extra-base hit in seven straight games from 6/29-7/6, all while playing catcher… according to Elias, became just the second Brave to accomplish the feat since 1900, joining Earl Williams from 7/14-20/72. Was named NL "Co-Player of the Week" for the period from 7/1-7 after batting .600 (15-for-25) with 6R, 4 doubles, 1HR and 4RBI in six games, including five multi-hit contests… led the Majors in batting average and hits over the stretch, while also leading the NL with a .600 on-base percentage. Was removed from 9/26 win vs. Philadelphia in the bottom of the second inning with a right adductor strain… missed the Braves' final four regular season games. Collected 1RBI in four NLDS games vs. the Dodgers (0-for-13, 3BB). Felt shoulder discomfort most of the season and underwent successful surgery to repair his right shoulder on 10/16 by Braves orthopedic surgeon Dr. Xavier Duralde in Atlanta, GA. Had an 11-game hitting streak, 7/3-21 : .357 (15-for-42), seven home runs, 16 RBI. Had nine home runs, 22 RBI and a .289 (24-for-83) average over a 25-game span, 7/3-8/7. Homered in four consecutive games, 7/5-8, including his ninth career grand slam in 7/6's five-run eighth inning. It was his second grand slam of the year (both vs. PHI). Hit his sixth home run on 7/27 in his sixth game vs. PHI this season and according to the Elias Sports Bureau, was the first player in MLB history to hit a home run in his (first) six consecutive games vs. PHI. Snapped an 0-for-17 skid on 9/8 at NYM with a 4-for-5 game with one home run, one doubled and four RBI. The four hits matched a career high (ninth time). Homered in back-to-back games 9/8-9 at NYM and hit .375 (6-for-16) from 9/7-12. Since the start of the 2006 season, leads all Major League catchers in home runs (151), extra-base hits (360), RBI (581), two-out RBI (246), game-winning RBI (73) and games played (944). Went 0-for-1 as a pinch-hitter on 10/5 vs. STL in the Wild Card Game. Led National League catchers in home runs (24), finished second in RBI (71) and ranked third in hits (126)and batting average (.270)...Was selected by the fans as the National League's starting catcher for the 2011 All-Star Game, his sixthstraightAll-Star game appearance. He is the only player in Braves franchise history to make the All-Starteam in each of his first six full seasons...Collected his fifth Silver Slugger Award and became one of just six catchers to win five or more careerSilver Slugger Awards...Since the start of the 2006 season, leads all Major League catchers in home runs (131), extra-base hits(326), two-out RBI (218), game-winning RBI (69) and games played (823). He trails only Victor Martinezin doubles (193) and RBI (514)...Notched his 200th career double on 9/27 vs. PHI off Roy Oswalt...Was on the 15-day disabled list from 7/27-8/14 with a strained left oblique; included an injury rehabilitationassignment to Triple-A Gwinnett...Went 3-for-5 with four RBI and a SB in 4/3's win at WSH. According to Stats Inc., he is the only catchersince 1947 to have four-or-more RBI and a stolen base in the same game three separate times. Was selected to his fifth consecutive All-Star game and became the first player in franchise history to makethe All-Star team in each of his first five full seasons...Was named MVP of the All-Star Game after his three-run double proved to be the game winner for the NL.Became first Brave to win the All-Star Game MVP Award since Fred McGriff in 1994...Collected his fourth Silver Slugger Award and became one of just eight catchers ever to win four or moreSilver Slugger Awards...Connected for his second consecutive Opening Day home run and his third in five career Opening Daystarts on 4/5 vs. Chicago (NL)...Hit his 100th career home run on 6/25 vs. DET, a solo shot to in the fourth inning off Andy Oliver...Hit his first career game-ending home run on 8/29 vs. FLA off Leo Nunez (HR was officially reviewed)...Since the start of the 2006 season, leads all ML catchers in home runs (107), extra-base hits (283), doubles(174), RBI (443) and GW-RBI (61)...Also since the start of the 2006 season, is third in the NL with 193 two-out RBI...The Division Series marked his second postseason appearance and first since 2005. He hit .429 (6-for-14)with 1 HR and 3 RBI to improve his career postseason average to .300 (9-for-30) with 3 HR and 8 RBI...Has a career .294 batting average (368-for-1263) at Turner Field with 53 home runs and 218 RBI. Collected his third Silver Slugger Award in the last four seasons. Is one of just seven catchers ever to win three or more Silver Slugger Awards...Was selected to his fourth consecutive All-Star game and became the first player in franchise history to make the All-Star team in each of his first four full seasons...Since the start of the 2006 season, leads all Major League catchers in doubles (149), home runs (86),extra-base hits (237), doubles (149), GW-RBI (52) and RBI (366)...Since the start of the 2006 season, is tied for fifth in the Majors with 170 two-out RBI (his 49 in 2009 ranked third in the Majors)...Led all NL Catchers with 21 homers, 94 RBI and an .834 OPS...Of his 21 home runs, 15 (71%) came with men on base...Had a single-season career high of 94 RBI with his two-run single in the sixth inning on 10/3 vs. WSH...Has a career .300 batting average (306-for-1020) at Turner Field with 40 home runs and 186 RBI...Tied his career high by driving in five runs on 8/23 vs. FLA...Had four game-winning final at-bat victories this season, including a three-run homer in the 10th inning at FLA on 7/30 and a bases-loaded, two-run double in the eighth inning at STL on 9/12...Had a season-high 11-game hitting streak where he went 14-for-40 (.350) with 6 2B, 2 HR and 12 RBI...Threw out 21 runners attempting to steal...He hit .420 (21-for-50) with four home runs and 11 RBI in interleague play...Was placed on the disabled list from 4/23-5/8 with a left eye infection...Appeared in six games for Team USA in the 2009 WBC (4-for-12 with 2 2B, 1 HR and 6 RBI). Was selected to participate in the 2009 World Baseball Classic for the United States team....Won his second Silver Slugger award (2006), becoming the 10th catcher in history with multiple SilverSluggers and one of four active catchers (Ivan Rodriguez, 7; Jorge Posada, 5; Joe Mauer, 2)....Since the start of the 2006 season, leads all MLB catchers with 65 HR, 272 RBI and 114 doubles....Set career highs in games (145), runs (68), hits (153), doubles (42), walks (57) and his first career triple....Led all major league catchers in 2B (42), T1st in HR (23), and was 2nd in RBI (87) and batting avg. (.301)....Tied for team lead with 44 multi-hit games....His .299 avg. vs. LHP was 8th in majors among all LH hitters (min. 140 AB)....Entered the 7/15 All-Star Game in the 15th inning, but did not bat. Became the first-ever Brave to make theAll-Star squad in each of his first three full seasons....Hit over .300 in May (.367), July (.333) and September (.316)....Was a .318 hitter (114-for-358) in night games and a .258 hitter (39-for-151) in day games....He hit .400 (8-for-20) with a HR with the bases loaded and hit .287 with 5 HR with RISP. Homered in three straight games 8/20-22 at CIN. Hit his third career grand slam in the 1st inning at CIN on 8/20. Had a career-high 12-game hitting streak snapped on 8/17 (15-43, .349). First half: .262 avg., 9 HR, 49 RBI, 19 doubles. After the break, he hit .279 , 9 HR, 43 RBI, 19 doubles. His two-homer game on 7/13 vs. PIT was the second multi-homer game of his career. Was ejected by home plate umpire Chad Fairchild on 6/23 vs. DET. Had first career four-RBI game 6/18 vs. BOS on a three-run homer and RBI double. Hit cleanup and went 3-for-6 with career-high three doubles in Game Two on 5/19 at BOS. Left game on 5/1 in the second inning with a bruised left ring finger (X-rays were negative). Returned tothe lineup on 5/4 and went 2-for-2 with 2 RBI. Hit .500 (6-for-12) with two homers in the opening three-game series at PHI. Clubbed a 2-run, game-tying HR off T. Gordon in the 9th inning 4/4 at PHI. On 3/22, agreed to terms on a six-year contract that includes a club option for a seventh year (2013). In just his second season, captured the NL Silver Slugger Award with a .333 average, 24 HRs and 93 RBI...Was named to his first career All-Star team. Went 0-for-1 and caught four innings at Pittsburgh...Brian was the only catcher in the majors to hit at least .300 with 20 or more homers...His 64 RBI after the All-Star break ranked third in the NL and his 18 HRs tied for ninth...His 58 extra-base hits rank as the third-most by a catcher in Braves franchise history...Batted .351 vs. RHP and .266 vs. LHP...Hit .438 (7-for-16) with bases loaded, .346 (36-for-104) with RISP and .471 (24-for-51) with 2out/RISP...Batted .351 (33-for-94) in the month of August and had eight homers and 27 RBI in September...Had his first career ejection by Joe West in the third inning on 9/28 vs. NYM and had career-high tyingnine-game hitting streak snapped (also 9/17-27/06)...Had a five-game home run streak, 7/15-19. It tied afranchise mark and was the longest streak by acatcher since CLE's Sandy Alomar in 1997...Had first-career multi-homer game and tied a career-high with five RBI on 9/24 at COL...Went 4-for-4 on 8/5 at CIN and 4-for-5 on 8/27 vs. WSH, his first two four-hit games...Had career-high nine-game hitting streak, 7/8-21 (15-for-40, 5 HR), seven of the games were multi-hit...Hit first career grand slam (#9) on 7/17 at STL off J. Weaver in the third inning...On the DL on 5/27 (retro to 5/24) until 6/9. Left 5/20 game at ARI after a collision at HP with E. Byrnes...Had a left-lateral ankle sprain...Was leading NL with a .350 batting average at time...Had a career-high five RBI and three hits 5/15 vs. FLA, including a three-run HR (#5) in the 6th inning...Clubbed his fourth homer on 5/13 vs. WSH, a leadoff shot in the ninth inning off Chad Cordero. Rookie backstop played in 59 games and batted .278 in 2005...Named to Baseball America and Topps' All-Rookie teams...Batted .333 vs. LHP and .264 vs. RHP...Hit .347 (26-for-75) with runners on base...The Braves went 33-16 in Brian's 49 starts...Contract was purchased from Mississippi (AA) on 6/8 inplace of the injured E. Perez, who was placed back on the 15-day disabled list...Made major league debut6/10 vs. OAK, starting at catcher and getting his first multi-hit game and RBI in the process...His first careerhit came off Danny Haren in the 2nd inning...Went 3-for-7 with a HR in his first two career games 6/10 and6/11...Hit his first career HR off OAK's J. Duchscherer in the sixth inning on 6/11...Had two of the four Braves'hits 6/30 at FLA, including his second homer...Went 3-for-5 with a homer (#3) and three runs 8/2 at CIN andwas 5-for-9 in three-game series (8/2-4)...Crushed a 3-run HR (#5) 9/10 at WSH off L. Hernandez to give ATLa 4-0 lead...Had the game-winning, one-run single in the eighth-inning on 9/23 vs. FLA to cap a four-run inningin which the Braves came back from a 3-0 deficit to win 4-3. Established career-highs in runs (45), 2B (35), and HR (16) with Single-A Myrtle Beach...Named to the Carolina League's All-Star Team...Rated as the Carolina League's top defensive catcher by Baseball America and as the league's eighthbestprospect...Ranked second in the league in doubles (35) and extra-base hits (51) and was fourth in sluggingpercentage (.494)...Led the Pelicans in total bases, doubles, home runs and RBI...Named the organization's third-best prospect following the season by Baseball America...Collected a hit in nine straight games 5/8-18 (17-for-36, 6 2B, 3 HR, 7 RBI)...Drove in a season-high five runs 5/31 at Winston-Salem (2-for-5, 2B, HR)...Recorded an RBI in eight consecutive games 5/28-6/6 (14 total)....Named league's mid-season all-star team...Named Carolina League Player of the Week for 8/30-9/6, going 13-for-29 (.448) with five doubles, twohomers, nine RBI and seven runs. Named Rome's (A) Player of the Year...Club wonSouth Atlantic League championship...Named to post- andmid-season All-Star teams...Established career highs inaverage (.290), games (115), 3B (3), RBI (71), and SB(7)...Ranked third in the SAL in doubles...Had nine-game hitting streak 8/20-28 (15-for-36 with 6 2B, 1 3B,and 12 RBI). Professional career began with the GCL Braves...Had season-best four-game hitting streak 7/27-31(7-for-17, 2 2B, 2 HR, 4 RBI). April 17, 2019 Atlanta Braves activated C Brian McCann from the 10-day injured list. April 7, 2019 Atlanta Braves placed C Brian McCann on the 10-day injured list. Right hamstring strain. 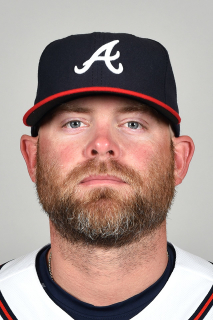 November 26, 2018 Atlanta Braves signed free agent C Brian McCann. October 31, 2018 C Brian McCann elected free agency. September 1, 2018 Houston Astros activated C Brian McCann from the 10-day disabled list. August 22, 2018 Houston Astros sent C Brian McCann on a rehab assignment to Corpus Christi Hooks. August 16, 2018 Houston Astros sent C Brian McCann on a rehab assignment to Fresno Grizzlies. July 3, 2018 Houston Astros placed C Brian McCann on the 10-day disabled list retroactive to July 1, 2018. Right knee discomfort. June 8, 2018 Houston Astros activated C Brian McCann from the 10-day disabled list. May 29, 2018 Houston Astros placed C Brian McCann on the 10-day disabled list. Right knee soreness. August 24, 2017 Houston Astros activated C Brian McCann from the 10-day disabled list. August 14, 2017 Houston Astros placed C Brian McCann on the 10-day disabled list. Right knee soreness. May 27, 2017 Houston Astros activated C Brian McCann from the 7-day disabled list. November 17, 2016 New York Yankees traded C Brian McCann and cash to Houston Astros for RHP Albert Abreu and RHP Jorge Guzman. August 17, 2014 New York Yankees activated C Brian McCann from the 7-day disabled list. December 3, 2013 New York Yankees signed free agent C Brian McCann. May 6, 2013 Atlanta Braves activated C Brian McCann from the 15-day disabled list. May 1, 2013 Atlanta Braves sent C Brian McCann on a rehab assignment to Gwinnett Braves. April 26, 2013 Atlanta Braves sent C Brian McCann on a rehab assignment to Rome Braves. March 23, 2013 Atlanta Braves placed C Brian McCann on the 15-day disabled list retroactive to March 22, 2013. Recovering from October 2012 right shoulder surgery. July 14, 2012 Atlanta Braves activated C Brian McCann from the paternity list. August 14, 2011 Brian McCann roster status changed by Atlanta Braves. August 12, 2011 sent C Brian McCann on a rehab assignment to Gwinnett Braves. July 27, 2011 Atlanta Braves placed C Brian McCann on the 15-day disabled list. Strained left oblique. May 8, 2009 Atlanta Braves activated C Brian McCann from the 15-day disabled list. May 6, 2009 Atlanta Braves sent C Brian McCann on a rehab assignment to Gwinnett Braves. April 28, 2009 Atlanta Braves sent C Brian McCann on a rehab assignment to Myrtle Beach Pelicans.